It was supposed to be non-partisan. But the recent Barangay and SK elections were practically a party politics. I wrote, Barangay Elections, Non-Partisan? Candidates of Barangay and SK Elections ally with town’s political big bosses. Town and city political figures ally with Barangay leaders by financing candidates and ensuring victory. There was massive vote buying in the recent Barangay and SK Elections. In our barangay, candidates for barangay council gave 30 pesos to 50 pesos per voter. Those who did not give lost. This scheme was also the reason why a virtually unknown person became the barangay’s new councilor. Barangay captains gave higher, from 100 pesos to 500 pesos. In my observations, the bigger the money, the higher the chance to get victory. I have yet to know a place where the barangay and SK elections were not played up by too much and unnecessary money. I could say that it was the worst SK election ever at least in our barangay. It was too tricky. Parents of one SK candidates even pawn some areas of their farms to raise P60,000 purposely for the elections. No wonder, SK voters were given some P500 to P1,000 each. To ensure victory, they emlpoy a very clever way – the “kidnap” strategy. What is “kidnapping” in tricky SK politics? This is a way to keep supporters to get contact with other parties, thus the chance of shifting of support can be avoided. For example, an SK candidate gather majority of SK voters in a place three to a day before election. Most of them brought those minors away from the barangay. For example, in Barangay Pugwan, the were brought to resorts and they stayed there until election day. Yikes! I saw the truckload of SK voters who went back to Pugwan to vote. I was so disappointed with what happened. How could parents allow their daughters and son to stay in a secluded place with the SK candidates considering that they were all minors? I wonder why SK elections become the “games of generals”. I could not see 17 year olds at work but the seasoned politicians. How much you get? How much they give? The questions before and after elections are now on how much was given and recieved than how good were the visions and programs of candidate or elected officials. In fact these questions were asked naturally on public places – as if one was asking how much a kilo of Tamban or Pirit nowadays. How did our shame blown away? Do your candidates pass the LASER test for Election 2010? As voters, we also need to do our homework. This is the reminder of a very good friend Novell Tagailo. By the way he is the same person who advocates that everyone should go out and vote on May 10, 2010 because we, the voters are the reason, why there is an election. So here is one of the most important homework that we should do: LASER Test. LASER is an acronym for Lifestyle, Action, Supporters, Election Conduct and Reputation. You should vote to candidates who pass the LASER Test. I will tell you why. Even before the election campaign started, we were already bombarded with tons of information about the candidates. The information are mostly conflicting, confusing, and misleading. I believe you have your own frustration on the way election campaign is run. It is characterized by negative stuff, mudslinging, personality assassination, and full of finger-pointing and accusations. Let us not allow ourselves to get drowned on negatives; instead, let us light the flame of optimism that through one vote, we can make a difference. This is the reason why I suggest that we use the LASER test and major basis for electing our country’s next leader. As a little background, LASER test is conceptualized by Dilaab Foundation to help us voters discern the best candidate to vote on May 10, 2010. The LASER test for election 2010 candidates are part of the campaign called Vote God. 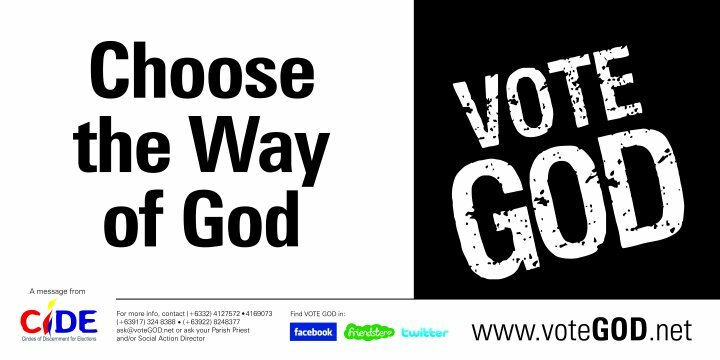 As described, Vote God is a faith-impelled advocacy which hopes to infuse the electoral process with Christian values and for the discerning bloc to muster enough moral courage to choose good leaders. I will tell you more about Vote God advocacy on my next post. The LASER test is best understood in the context of Christian values. When you run the LASER test to your candidates, it is very important that you put God at the center. By doing this, you erase the political color you already put on yourselves. What is my candidate’s lifestyle? What are the actions of my candidates? Who are the supporters of my candidates? Are they the supporters also pass the LASER test? What is the election conduct of my candidates? Does he focus on his plan or put pains to his opponents with his dirty political tactics? Does he follow election laws and guidelines? What is the reputation of my candidates? Let us pause and reflect. This is about our future. Let us do our homework. We still have time. An election in the Philippines without vote buying happened recently. Thanks to the people who continue to believe and continue to have faith. Thanks to God. I used to believe that vote buying cannot be eradicated unless people are totally wiped out. I’m felt so sorry for this wrong thoughts. When I saw the video on the case of Calidngan. I felt the shame to myself. There was a moment of guilt. Then, I was inspired and felt blessed. Calidngan is a mountain barangay nine kilometers away from Carcar City, Cebu and 40 km away from Cebu City. The main way of living there is farming. The people in Calidngan prove that an election without vote buying is possible. Please watch this video. Let’s continue to believe on small beginnings. Now tell me, it is possible that we can have an election without vote buying? Yes, it is. Yes we can. In less than 30 days we will go out and vote. Will you vote? Most of the people I know say yes but many others say maybe and some no. All of them have reasons. Many of us are sick and tired of the vicious cycle of Philippine politics. We elect new officials because we want change. We want election because we want change; and the people we have just elected are not satisfactory. This will be repeated and seems never ends. The Philippine elections have always been intense political exercise, journalist Sheila Coronel observes. As the call for change was highly audible before the start of election 2010 period, many Filipinos expect some changes on the way we conduct our elections. I personally expect that we shall actively discuss on platforms rather than personal issues; that we will tackle more on real social issues rather than the usual mudslinging and personality assassination. I am dismayed because the 2010 election is still the same as the 2004, and 2007 elections. These are the elections that I have closely observed. Just the same. In fact, this election is worse as more trash are thrown, more dirty tricks than before. If this is the case, should we stop electing officials? Should we lose our faith to election? We should not because in our democratic society, it is during election that we are given equal rights. Whether you are rich or poor, schooled or unschooled; you have only one vote. We are the reason, why there is an election, they, the candidates are not the star. We are the principal characters here. Let’s take this privilege, use this right and exercise our duty. He is right. The principal characters during elections are the voters. And the power are within the voters. As voters, let us use this power to start the change that we are dreaming for. Joey De Venecia III: From whistle-blower to Senator? Jose “Joey” De Venecia III aimed to win the contract for National Broadband Network (NBN). He lost. Not enough, he was grilled in a national controversy! That changed the life of Joey. From being a private individual to a public figure. He bid and lost in a business contract. Now he is dreaming to become a senator. About the image: Joey De Venecia filed his certificate of candidacy at the COMELEC. He is running (as newest party member) under Pwersa ng Masang Pilipino (PMP) of former President Erap Estrada. Image is from Facebook profile of Joey De Venecia. Will fate favors Joey De Venecia this time? As veteran businessman, he lost in a billion Pesos worth of deal. Now as newcomer to politics, will he go home victorious? Joey De Venecia was here is Cebu to meet some youth leaders and bloggers. To campaign, of course. Before I went to attend the meet and talk with Joey De Venecia, I asked three neighbors if they think Joey will win. I got, ambot lang kaha (We don’t know. ), paminawon lang (Let’s see. ), kinsa man na? (Who is he? ).Will they vote for him? I got, wa pay siguro (Maybe). Who is Joey De Venecia? Who is Joey? NBN-ZTE deal witness. Son of Jose De Venecia. Apparently, we see him as the one who lost in a bidding and whistle-blow about bribes and corruption. More than that, Joey De Venecia is a successful businessman. His biography in his official website (joeydevenecia.com) claimed that Joey changed the Philippine business landscape when he founded and launched broadband technology in the Philippines in 2000. The same site says that Joey de Venecia III also pioneered and set up the first full-pledged call center in the Philippines. Why he wants to become senator? So, he is not a politician as he claimed, but why is now running as senator? Why he entered into politics? Is it because he needs to? Or is it because he wants to? Or because he is now known? Many known people wants to go to politics. There are exemptions, of course. I asked why he is now entering into politics. Before he answered, he clarified that he is a politician as he entered into the world of politics but clarified that he is not a traditional politician. He entered into politics because he has seen there is a need for him to contribute his expertise. I agree, he is not the traditional candidate I have meet. during the entire talk, I never heard him sour-graping. He focused on his platform rather than on throwing mud to other candidates. Politics is not a new thing for Joey De Venecia. His father served five terms as House Speaker. Politics must be in his blood. Still, having not held any elective post, being newbie in politics is undebatable. One thing we are not sure this time is that if he had already “played” with politicians. Let us remember that his father, former Speaker Jose De Venecia, Jr., was still in his position when Joey bid for NBN. There is one thing I am sure of. Joey De Venecia changed the political landscape of the country. Without his testimony in the Senate, his father could still have been the House Speaker. JDV could still be the staunch ally of President Arroyo. Was it the turn of events drag him to politics? The aborted NBN project was the culprit. It was the controversy that made him known. His TV ads project this message: computer connected to internet for everyone. He stressed that a computer connected to the internet in every Filipino home [will] give everyone access to livelihood and educational opportunities and bring the country firmly into the Information Age. He elaborated that a personal computer, internet access and information support will have an immediate and dramatic impact on Filipino families [and] would give them enhanced educational and livelihood opportunities that are only available from IT, and a means for OFW families to re-integrate with their loved ones working abroad by commuting on the cyber-highway. Is it possible? Joey said, this is not an impossible dream, but rather a realizable goal. After the short talk, in a chit-chat with fellow Cebu bloggers, I asked some of them if nodding of their heads as Joey talked can be understood as equivalent to votes. I got mixed answers. Somewhat the same and somewhat different to the answers I got when I asked to my three neighbors. The best title of this should have been, Joey De Venecia III: From business to politics. But the title has been written and I opted not to change it. Gilbert ‘Gibo’ Teodoro, Jr. always remember to remind his supporters and friends to continue to uphold the principles of positive campaigning. During his proclamation rally, Gibo Teodoro vowed to launch positive campaign. And he is really doing it. In his recent visit to Cebu, Gibo Teodoro told his Cebuano supporters. I reiterate my stand once again that this election campaign is […] run by us on a positive note without any negativism as much as possible except to answer. […] We know our platforms; we know our capabilities. Our track record is before the people to scrutinize. We don’t need to bring somebody else down to bring ourselves up. As the former Defense Secretary delivered this message, supporters (mostly wearing green T-shirts) gave him the loudest applause. I was stunned with what I’ve heard. He is indeed not the usual pulitiko that I know. Gibo’s message was more than enough to inspire everyone at the times when severe negative campaining (mud-slinging) continues. Gilbert Teodoro was in Cebu last Sunday to meet and greet his supporters, the Green Team Cebu (G1BO2010) (a group that supports his candidacy), and other groups and individuals. Upon hearing him, I proved once again that we are on the right path and never been wrong in choosing Gibo to be the next president to lead the country. In Philippine politics, negative campaigning is synonymous to pamulitika. It is very easy to tell if someone is namumulitika or not. Characterized by personal attacks, tagging of opponents (as evil, corrupt, dishonest) and doing other dirty tricks; negative campaigning has always been believed as way to win an election in the country. We are used to negative campaigning. So, it is no longer surprising if many candidates are running negative campaigning (read as “hate” campaigning) as way to win in 2010 elections. But not Gilbert Teodoro. He has faith on positive way of getting support and votes. As a presidential aspirant who advocated for national reconciliation, Gibo focuses on his platform of government and avoid ‘down-grading’ someone. Many of those who observed the 2010 election campaign notice this. In the age of online media, negative campaigning in the country worsen. For example, pictures are edited making the candidate look either horrible or hilarious. Attacks, personality assassination are shared through social networks, micro-blogs, emails, and blogs. Because of worsening negative campaign strategy, the real issues, articulation of platform of government are always less tackled. Filipinos are now sick and tired of negative campain tricks. I am one of those who wishes that election discussions shall be focused on crucial social, economic, and security issues, and on how a candidate views and addresses these. So what is positive campaigning? Positive campaign focuses on platform of government. It is putting political bickering in the back alley; it is getting through the election without division; it is carrying this election on positive notes. Teodoro told these as reported by ABS-CBN News reporter Karen Reyes-Caringal. Supporters of Gilbert Teodoro, Jr. has a clear definition of what a positive campaign is through the Manifesto for Positive Campaigning. We, the supporters, volunteers and friends of former Defense Secretary Gilberto “Gibo” Teodoro, vow to uphold the principles of POSITIVE CAMPAIGNING this election season. You can read the the full text of Manifesto for Positive Campaigning in a Facebook account and in an article of the same title published in Filipino Voices. Whether you support Gilbert Teodoro or not, you can take part in encouraging positive campaign. There many simple things you can do. If you got an email with horrible and hilarious article or picture of a candidate, try not to forward it. If you see a ‘hate’ video or evil-looking pictures of candidates shared on Facebook, try not to share it. If you hear rumors and you know it’s a fabricated one or just part of dirty tricks in election campaigning, simply try not to re-echo those things. Photos by Melvin Alcarez Banzon and Anya Rodriguez Unchuan. Used with permissions.